Devonshire (or Devon) Cream is a clotted cream produced commercially in Devon Cornwall and Somerset England. It is a thick, rich, yellowish cream with a scalded or cooked flavor that is made by heating unpasteurized milk until a thick layer of cream forms on its surface. The milk is then cooled and the layer of cream is skimmed off. 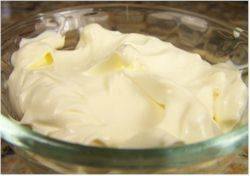 Clotted cream has 55-60 percent fat content and is so thick it does not need to be whipped. Now this technical description may tell us what it is and how it is made but it does not adequately describe its wonderful sweet flavor or how it makes the perfect accompaniment to scones with jam. If you haven't tried it I would recommend hunting it down as, unlike years gone by, it can now be found in specialty food stores and even some mainstream grocery stores are stocking it. You can also buy it through mail order below. If you have access to unpasteurized cream, the 'Joy of Cooking' tells us how we can make our own clotted cream. (I have never tried this as I cannot seem to find unpasteurized cream in grocery stores.) Begin by taking unpasteurized cream and letting it stand for about 12 hours (during the winter months) or 6 hours (during the warm summer months). Then to sterilize the cream; place the cream over very low heat (do not boil) until rings form on the surface of the cream. Store in a cold place for at least 12 hours and then skim the thick clotted cream from the surface of the cream. You now have homemade Clotted Cream. Barring the fact you cannot make your own or buy the real thing, this recipe makes a nice substitute to go with your scones. It consists of beating mascarpone and whipping cream with a little sugar and vanilla extract. For those who are unfamiliar with Mascarpone, it is a soft unripened cheese that belongs to the cream cheese family. It comes from Switzerland and Italy and is a thick, rich, sweet and velvety, ivory-colored cheese produced from cow's milk that has the texture of clotted or sour cream. Its delicate and mild flavor is great with fresh fruit and is probably best known for its use in Tiramisu. Produced mainly in the fall and winter it is sold in plastic tubs and can be found in specialty food stores and in the deli section of some grocery stores. Makes about 1 1/2 cups. Preparation time 15 minutes.